Jericho Poppler "1999 Woman of the Year"
Jerricho Poppler raised in Long Beach California, considered ballet and jazz her passions. She danced for years prior to getting into surfing which contributed to her graceful surfing style. Poppler dominated the surfing scene with a decade of championship titles from all over the world. This helped her earn her own "Jericho Poppler" model surfboard with world famous shaper Robert August. 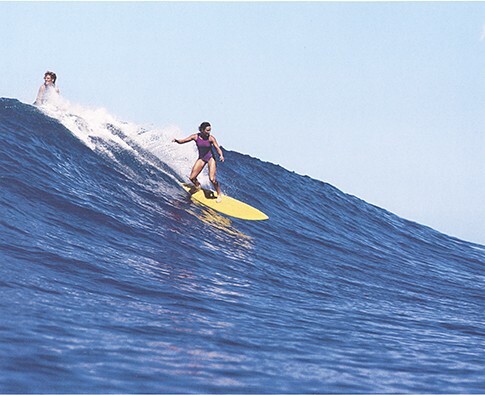 She was co-founder of the Women's International Surfing Association in 1974, and co-directed the first Women's International Professional Surfing Championships and developed the Women's Professional Surfing Coalition. Jericho is an active environmentalist, she served a five-year term as a board member of the surfrider foundation during the 1980s and created "Jericho's Kids for Clean Waves" in 1993, a surf contest for children under 16 that features environmental outreach and educational programs. And still Jericho still finds time to be a trustee of the Huntington Beach International Surfing Museum.